A Presidential candidate’s stance on major policy issues greatly impacts how Americans vote, which impacts political betting. However, political party affiliation can also affect how voters align themselves to a potential candidate which provides another factor to consider when wagering. To explain this phenomenon in more detail we will be using the 2016 Presidential Election as a scale for how policy issues can move voter support and election results. Republican and Democratic-affiliated voters focus on different aspects or themes of policy issues. During the 2016 Presidential Elections distinct economic, racial, gender, and lifestyle dysphorias greatly affected each party affiliates perceived importance on certain issues. Republican supporters often focus on immigration and terrorism issues while Democrats maintain a focus on terrorism while placing the treatment of racial and ethnic minorities above immigration concerns. Trump supporters reported the economic as a major focal point for their vote at 90%, at 89% terrorism policies came a close second in importance, at 79% immigration policies along with foreign policy came tied for Trump supporters third most important policy issue. Surprisingly gun ownership rights came 4th in importance at 71%, while the treatment of minorities, the environment, and LGBT+ rights ranked lower in importance at 42%, 32%, and 25% respectively. Clinton supporters placed the economy as their most important policy issue at 80%, the treatment of ethnic and racial minorities ranked as their second most important issue at 79%, terrorism and gun policy were tied and ranked third most important at 74%, foreign policy at 73%, the environment at 69%, immigration at 65% and LGBT+ rights at 54%. The age of a voter adds a considerable factor in relation to which policies are personally considered most important which could potentially sway votes. In 2016, older Americans were shown more likely than younger Americans to list a Supreme Court appointee as an important policy decision factor, as well as, Social Security policy issues. Three-quarters of those between 50 and 64 and 65 or older said Supreme Court Justice Appointments were extremely important policy issues. Only 60% of those between 30-49 and 45% those under 30 listed Supreme Court Justice appointments as an important voting issue. When comparing the issue of policies affecting Social Security 75% of those between 50-64 and 78% of those over 85 placed a higher importance on this compared to 58% for those between 30-49 and only 57% for those under 30. However, on concerns of terrorism age variation does not produce as drastic of a variation in importance. 86% of those over 65 say terrorism policies are important, 85% for those between 50-64, 77% for those between 30-49, and 68% for those under 30 say the same. On the other hand, age plays a huge factor in determining the personal importance of policies which affect LGBT+ individuals and racial and ethnic minorities of which younger Americans show more importance on. 74% of people under age 30 believe minority treatment is an important policy issue compared to only 56% of those over the age of 65. For the treatment of LGBT+ individuals, 50% of those under 30 say it is an important policy issue while only 32% of those over 65 agree. The number of individuals from a certain age group which vote according to policy issues could greatly affect the results of an election. This in turn, usually has bettors scrambling to understand how public opinion and personal importance to policies can affect election outcomes. How Americans vote is closely related to which party the voter is affiliated with as most know voters tend to align with their party’s ideas and viewpoint which is why they typically vote for the candidate in their party. Princeton Professor of Politics and Roger Williams Straus Professor of Social Sciences, Christopher Achen explains how historically voters make choices, “…We [have] known for over 50 years, [most] people vote for the candidate in their party, even if the candidate represents their party’s policies poorly or [the candidate] is personally unappealing”. Looking at Professor Achen’s work one can note voters with strong party alignments tend to have blinders on, believing negative press or information regarding the opposing candidate while explaining away issues regarding their party’s candidate. Strong party affiliations will create loyal party voters through ideological adoption which is why historically we have seen Democrats voting for Democrats and Republicans voting Republican. Normally, this information can assist bettors is breaking down national statistics and registered party affiliates to better determine a possible winning candidate. This information is not only useful to bettors but to polls and online election sources who track red, blue, or purple states which often greatly affect election results depending on if a radical flip occurs in a swing state. When comparing each 2016 Primary Party Candidates stance on certain policy issues it becomes easier to align certain demographics of voters to keep policy issue, however, this is not standard as exceptions exist. However, articles, policy advocation, political social posts, and polls can be used by bettors to better understand how American voters feel towards certain candidates and issues to better predict results for optimal profits. Political bettors, in fact, usually spend hours researching public indicators to better narrow potential election results so they can wisely place bets. 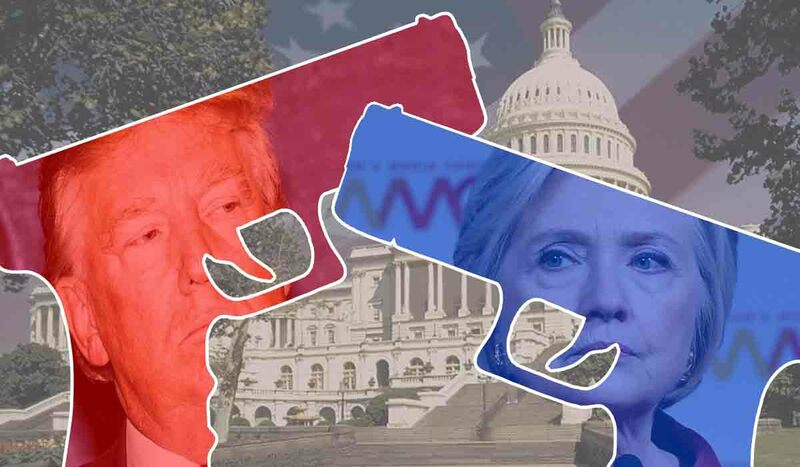 Gun Control – While Trump has changed his personal stance on gun policies, during his Presidential Campaign he promised to protect the rights of gun owners and preventing any legislation which would impede on the right to bear arms. Clinton stated she would close loopholes in current laws which allow criminals to obtain firearms, as well as, ban high-caliber assaults weapons, and focus on mental health access. War on Drugs – Trump blamed the drug and opioid crisis on unprotected borders and drug smugglers and suggested tighter control of our border. Clinton suggested a $10 billion initiative to fund Substance Abuse Prevention and Treatment programs throughout the nation. Both candidates were hesitant to consider the reclassification, decriminalization, and legalization or recreational marijuana. Terrorism – Trump’s stance on terrorism in 2016 could be considered xenophobic by some as he called for the more complete profiling of Muslims and drew direct ties between immigration controls and national defense. Clinton made wild direct claims at Trump stating he was a “recruiting sergeant for the terrorists”, Aside from these comments Clinton stated she would launch intelligence programs to identify and prevent attacks, as well as, counter propaganda and recruitment efforts online. Abortion – During Trump’s Presidential campaign the candidate often remarked how he would specifically appoint a Pro-life Supreme Court Justice to automatically overturn Roe v. Wade, a key case which Federally permitted abortions in the US; Supreme Court decisions can also affect odds. Clinton claimed to support Roe v. Wade despite once voting against a federal Partial-Birth Abortion Ban in 2003 which specifically outlawed partial birth abortion without exceptions. Immigration – This was a top issue for Trump who took several stances on it, the candidate stated his desire to build a wall along the border of the U.S. and Mexico and to deport 11 million undocumented immigrants living in the United States. Clinton stated she would continue Obama’s Executive Order to protect certain undocumented workers and expand his policy to include those with a history of service or who are victims of extreme labor violations. The candidate also supported immigration reform which provided a pathway to citizenship and allow those undocumented to receive Obamacare. Each candidate’s stance on these issues would have certainly swayed voter’s alignment with the candidate and issue. Political bettors at the time must have thoroughly examined each of the candidate’s statements and predicted the likeliness of their election win. When betting politically policy stance can create an enormous impact on how voter’s feel and their behavior which in turn affect the results of an election and a bettor’s wager. Political bettors will surely research similar factors and public indicators in the 2020 Presidential Election.